When the U.N. sowed cholera in Haiti, how fast did Americans know? New emails reveal just how soon American officials realized the U.N. had brought cholera to Haiti. What they did next helped pave the way for Trump. A protester holds up a sign during a demonstration against the U.N. mission in downtown Port-au-Prince, Haiti, on Nov. 18, 2010. Halfway through her confirmation hearing in January, the nominee for U.S. ambassador to the United Nations, Nikki Haley, found herself navigating a river of human waste in Haiti. Some suspected the then–president-elect had picked the South Carolina governor, who had no foreign policy experience, in order to exile a potential rival to an institution he’s derided as “a waste of time and money.” But for two and a half hours, as senators probed her on places like North Korea, Ukraine, and Israel, the nominee held her own, shoring up talking points with governor’s office banter. That’s when Sen. Ed Markey, the junior Democrat from Massachusetts, asked about a crisis that threatens nothing less than the legitimacy of the United Nations itself. The crisis is the cholera epidemic in Haiti, a still-unfolding catastrophe that all available evidence shows began when U.N. peacekeepers from Nepal infected the country’s most important river system in October 2010. Yet still, after more than 10,000 people have died and incalculable damage has been done to a country the United Nations swore to protect, no one has been held accountable. She is not the first U.S. official to duck the question. As seen in newly revealed emails, reported here for the first time, officials at the highest levels of the U.S. government were aware almost immediately that U.N. forces likely played a role in the outbreak. Multiple federal agencies, from national security officials to scientists on the front lines, shielded the United Nations from accountability to protect the organization and themselves. Obama’s U.N. ambassadors, Susan Rice and Samantha Power, dodged the issue as the administration danced between often contradictory goals of protecting human rights, asserting American dominance, and defending an institution central to its multilateral diplomacy. As he left office in December, U.N. Secretary-General Ban Ki-moon was forced to grudgingly apologize for the organization’s role in poisoning Haiti’s watershed and propose a plan to end the epidemic. Member states, however, are refusing to provide the $400 million he promised. The result is an ever-deepening health crisis in which about one Haitian dies from cholera per day, amid incalculable cost to the country’s economy and social fabric. Those actions and inactions fostered mistrust and damaged reputations—including Secretary of State Hillary Clinton’s—helping pave the way for the first explicitly anti-humanitarian U.S. presidency in a century. Trump mocks the U.N. as “just a club for people to get together, talk and have a good time.” His advisers want to slash U.S. funding for the United Nations by more than $5 billion as part of an effort to gut the foreign and global health aid that has been a pillar of U.S. foreign policy since the end of World War II. But the past will not be easy to cast off. After a century positioning itself as the world order’s indispensable leader—often through U.S-based global organs like the U.N.—America has a legacy that runs deep in every part of the globe. Trump inherited control of not only the globalized, U.S.-dominated economy his predecessors helped create, but the refugees of their wars and the increasingly urgent consequences of environmental ruin. And nowhere are the stakes of that legacy as clear as in Haiti. Evenel Dorvilier rests on a stretcher at a cholera treatment center in Port-au-Prince in 2016. 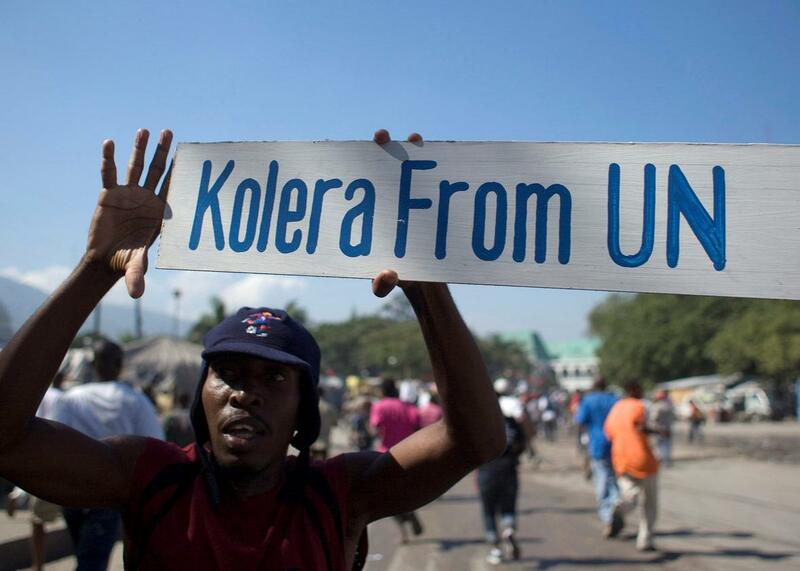 Years after the U.N. sowed cholera in Haiti, people are still contracting the disease. On Oct. 20, 2010, the U.S. Centers for Disease Control and Prevention confirmed the first recorded cholera outbreak in Haitian history. Within days, 300 people would be dead. In a country where few had clean water, adequate sanitation, or immunity to the disease, experts knew the waterborne infection could rip through the island like lightning through an ungrounded swimming pool. But the analyst, Rohit Chitale, wasn’t writing about finding the source. He was relaying a concern from higher up in the U.S. government that someone else already had. The National Security Council is the U.S. government’s highest-level defense-planning body. Its chairman is the president of the United States. What’s fascinating here is the timing: The first international news report linking the U.N. to the outbreak—my dispatch for the Associated Press—would not appear until a day later, Oct. 27. It would take a handful of journalists, university labs, and independent epidemiologists, often working at odds with the U.N. and its allies, weeks more to gather evidence cinching the conclusion. Thanks in part to aggressive official denial and pushback in the press, most people outside Haiti would not learn about the probable link for months, if not years. The U.N. would continue denying any involvement in the outbreak until it finally admitted in 2016 having played a role. By then, at least 800,000 people in Haiti had been sickened and officially more than 9,500 killed, with experts estimating the real toll could be two or three times higher. Yet less than a week after the outbreak was confirmed, top officials in Washington tasked with global issues of war and peace were already concerned about what the outbreak might mean for the U.N. In a phone interview, Chitale could not recall where his NSC contact got their information. An NSC spokesman declined multiple requests for comment. State Department officials would not say when or how they learned that the U.N. was likely responsible for the outbreak. What is clear is that U.S. experts and officials followed an immediate instinct to move into damage control. Minutes after receiving Chitale’s email, the director of the CDC’s emergency operations division forwarded it to four other senior colleagues. One of them, a veteran CDC epidemiologist named Muireann Brennan, noted that another in the group was a scientist “already working on a document that will say what we can and can’t say” about the pending lab results. When cholera broke out in central Haiti, both the United States and U.N. were heavily involved on the island. Nine months earlier, a magnitude 7.0 earthquake had struck the southern part of the country, killing an estimated 100,000 to 316,000 people. Obama had declared his commitment to save lives in Haiti, which advisers hoped would signal a break from his predecessor’s disastrous foreign policy and much-criticized response to Hurricane Katrina. Thousands of responders and billions of dollars had been dedicated to the recovery. The U.S. was also funding a crucial election in Haiti, for which the peacekeeping force—the U.N. Stabilization Mission in Haiti, or MINUSTAH—was tasked with overseeing security. Protecting the U.N. was a priority. The genomic tests discussed in the Oct. 26 emails revealed that the Haiti samples did match isolates from South Asia, including Nepal, and equally important, that the Haiti isolates all came from a single source. Those findings bolstered the hypothesis that U.N. troops—the only significant South Asian population on Haiti’s sparsely populated central plateau—introduced the disease. In the document written following the discussion about “what we can and can’t say,” the CDC scientists added a prominent caveat: without further evidence, the genomic tests alone did “not prove that the outbreak strain was brought directly from South Asia to Haiti.” This cautiousness would be echoed for months as CDC scientists publicly cast doubt on whether an answer could ever be found. The truth was that neither the CDC nor its partners in the U.N. system made an attempt to uncover that evidence. From Oct. 21 to 23, CDC and Haitian health ministry investigators visited hospitals in the lower Artibonite River Valley, interviewing 27 patients who lived or worked in rice paddies nearby, according to the CDC. Eighteen said they had drunk untreated water before getting sick. Yet no effort was made to figure out which water source was putting them at risk. The CDC also knew some of the first stool samples sent to the national laboratory had come from villages 50 miles up the Aribonite River, around the town of Mirebalais—including Mèyé, the village where the U.N. base was located. But, the CDC openly acknowledges, the Americans did not go there to investigate. In a recent interview, Jordan Tappero, then the incident manager for the Haiti cholera response, said the CDC did not have enough resources to address those questions as well as to respond to other elements of the outbreak. “Our mission was to save lives, and we had no room for distraction,” he told me. CDC interventions probably helped lower the death rate by several thousand, he said. 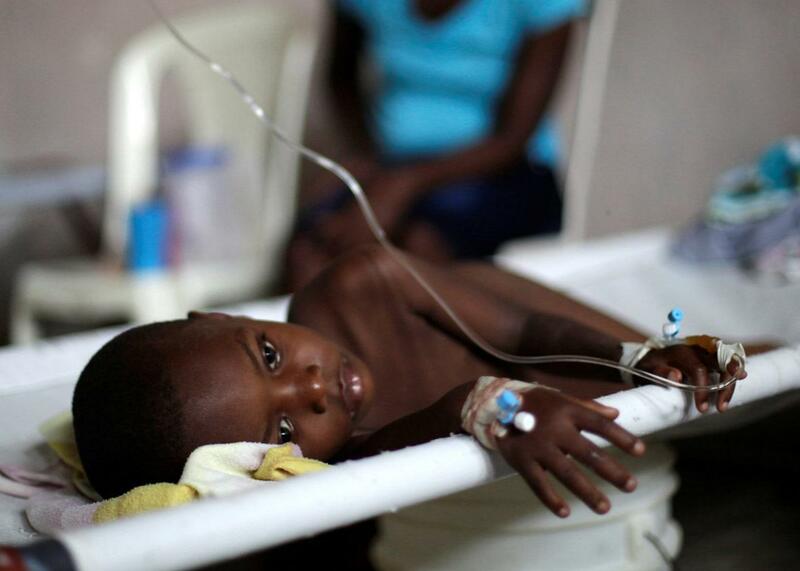 Yet despite having far fewer resources, Haiti’s health ministry sent its own teams to investigate the area around Mirebalais on Oct. 19 and 21, where they found 15 likely cases of cholera. No one from the CDC accompanied them. CDC epidemiologist Eric Mintz chimed in: “I fully agree with Peter’s assessment.” Two days earlier, Mintz had poured cold water on the link between the U.N. and the epidemic in a CNN interview, citing a lack of evidence. Meanwhile, the U.N. troops destroyed evidence at their base, including digging up leaking pipes and draining septic tanks, before scientists could examine it. “To call CDC’s lack of interest unusual is an understatement,” Ralph R. Frerichs, founding chair of the University of California at Los Angeles’ epidemiology department, wrote in his 2016 book, Deadly River: Cholera and Cover-Up in Post-Earthquake Haiti. The stonewalling had consequences. In November 2010, anger over the U.N.’s refusal to give answers spilled over into fiery protests in northern Haiti. Young men pelted peacekeepers with rocks. At least three protesters were killed. Under pressure, U.N. Secretary-General Ban Ki-moon appointed a four-scientist panel to investigate. Cravioto led the group, stopping at CDC headquarters in Atlanta on his way to Haiti in February 2011. But after four months of delays and the active destruction of evidence, there was not much for investigators to find. Their May 2011 report strongly suggested the U.N. was responsible for the epidemic but lacked definitive proof. For their part, the U.S. government scientists do not believe they abetted a cover-up. Tappero, now director of the CDC’s Division of Global Health Protection, was quick to emphasize the role of Haitian behavior in our interview—telling me that Haitians don’t experience “shame associated with open defecation.” Yet those same scientists are much more cautious when it comes to talking about the well-documented, dangerously negligent sanitation practices of the U.N. or the mounting proof showing how their negligence cost thousands of lives. Ironically, it may have been partly the very obviousness of the outbreak’s origin that led to U.S. government scientists’ lack of interest in proving it. “We focused a lot more on the response versus the attribution, but that’s because we figured yeah, it probably did come from the U.N,” Chitale told me. 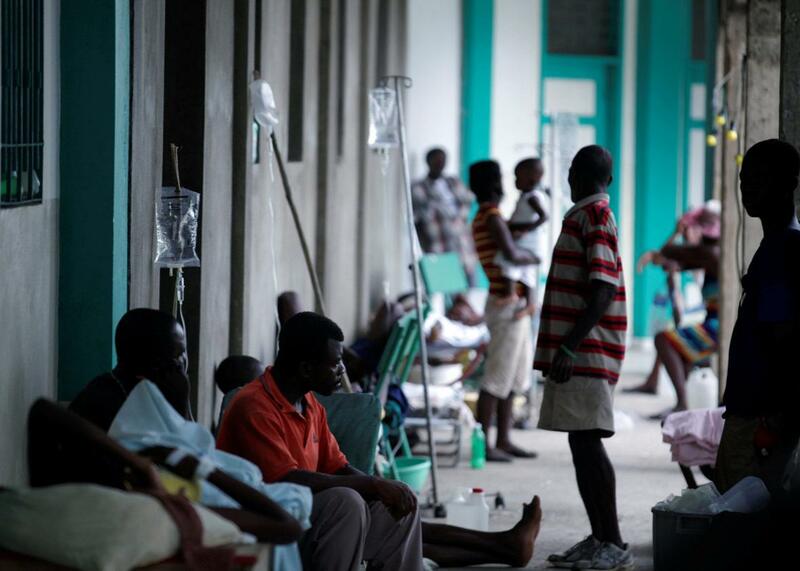 The U.S. also sided against Haiti’s cholera victims in other key ways. Thousands of victims and their families petitioned the U.N. for redress in 2011, seeking money to stop the epidemic and assist the millions of people directly and indirectly harmed. When the U.N. refused to hear their claims, lawyers with the Institute for Justice and Democracy in Haiti sued the United Nations in U.S. federal court. Justice Department lawyers appeared in the U.N.’s stead to argue that the U.N.’s absolute immunity from legal process under a 1947 treaty meant the suit should be thrown out. The federal judges agreed. Relatives and patients treated for cholera after Hurricane Matthew in the Hospital of Port-a-Piment, Haiti, on Oct. 9, 2016. U.N. officials proposed a $400 million effort to be voluntarily funded by member states. As initially conceived, about half the money would pay for health and sanitation to eradicate the disease, and the rest would go to Haitian victims, their families and communities. So far only France, India, Liechtenstein, Chile, and Ban’s native South Korea have ponied up, for a total of roughly $2 million. The United Kingdom pledged a few hundred thousand. Canada and Japan promised to separately redirect aid money to the effort. Sympathetic U.S. officials were unable to get any money out of the Obama administration before it ended. Given that Trump is currently proposing to slash funding for everything other than the U.S. military and the Mexico border wall, it seems unlikely the new administration will do differently. Not even Congress was able to get a straight answer on how the last administration justified the lack of accountability. Senators including Patrick Leahy, the top Democrat on the Appropriations Committee, wrote Power while she was ambassador to argue for the U.N.’s legal responsibility toward Haiti. The State Department replied and simply avoided the question, said Tim Rieser, Leahy’s foreign policy adviser. Trump has never shown much interest in current or formerly colonized parts of the world, other than as places to make money. He briefly glommed onto Haiti at the end of the campaign when he realized Haitian Americans weren’t fond of his opponent, the former secretary of state—particularly in the crucial swing state of Florida. But his only action toward the country since winning has been to legitimize its even more recently, even more dubiously elected new right-wing president, Jovenel Moïse, with an inaugural delegation of longtime State Department hands and Trump’s favorite black reality TV co-star, Omarosa Manigault. Barring some overnight spasm of interest, Trump’s Haiti policy will probably fall back on the Republican default. At her confirmation hearing, Haley echoed talking points from the conservative Heritage Foundation, which has used the Haiti cholera issue to call for U.N. reform, while making sure to stop short of having the U.S. held accountable in any way. Like Haley, its experts have also recommended passing the buck to troop-contributing countries such as Nepal—ignoring the fact that the U.S. called for, voted for, and took the lead in paying for those peacekeeping missions in the first place. Meanwhile, no senior U.N. officials have been fired or punished for their roles in the cholera epidemic or cover-up. Guatemalan diplomat Edmond Mulet, who headed MINUSTAH when cholera was introduced, was continually promoted even as he openly lied about the epidemic’s origins. He eventually became Ban’s chief of staff and sat directly behind Ban as the U.N. chief recited his vague apology in December. Member states ignored a letter from the new secretary-general, former Portuguese prime minister António Guterres, asking them to declare by March 6 if they intended to contribute to the $400 million cholera fund. Insiders say a proposal to force member states to come up with that amount—a fraction of the billions spent on MINUSTAH over 13 years—by assessing it as part of their regular U.N. dues has likely been shelved amid resistance from the United States, Russia, and China. Those flaws give Trump, Haley, Secretary of State Rex Tillerson, and the administration’s allies plenty of cover in arguing for less American participation in an imperfect body. Trump’s problem is that, for 70 years, the United States has depended on a strong and accountable United Nations as a linchpin of American power. Founded by the victors of World War II in 1945 to prevent another global war, the institution headquartered on the east side of Manhattan has provided a place for countries to hash out their differences and make alliances—and yes, “get together, talk and have a good time”—instead of massing troops on borders and punching in launch codes. The United States has used its veto-wielding position on the Security Council to legitimize its policies and condemn its rivals. But as the kind of anger and mistrust of the United Nations that has grown in Haiti is felt around the world, the authority and protection it has provided could come to an end. Trump was born a year after the United Nations was founded. He wasn’t in charge when its peacekeepers brought cholera to Haiti, nor when the U.S. government helped shield its leaders from accountability. But he’s inherited its legacy, good and bad. And in global politics, as the new president may now be discovering, you can’t just declare bankruptcy to get out of your debts.